QSC has been awarded a utility patent from the United States Patent and Trademark Office for its Q-SYS Web Conference Integration Solution. This patent (USA 9,973,638) recognizes the solution’s ability to bring an IP camera stream from Q-SYS PTZ-IP conference cameras into soft codec applications (like Zoom, Skype for Business, GoToMeeting, etc.) via a driverless USB connection. The patent also recognizes the ability of the Q-SYS Platform to discover and control Q-SYS IP conference cameras on a standard Ethernet network. 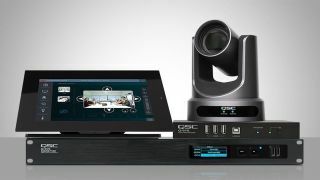 This allows users to quickly leverage their network to transmit professional-quality video from Q-SYS conference cameras to at any PC, offering a simple, plug-and-play experience for meeting room applications.